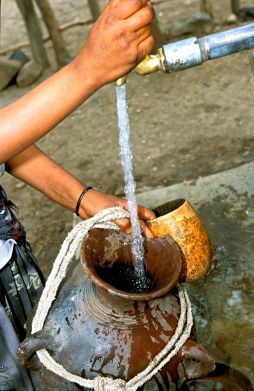 Roughly 80% of all diseases in poor countries resolve from dirty drinking water (BMZ [Bundesministerium für wirtschaftliche Zusammenarbeit und Entwicklung]). Germs in drinking water lead to diarrhoea and other illnesses. Especially in case of undernourishment these diseases can have severe and even deadly consequences. Affected people and foundations of life: About 879 million people do not have access to hygienic water, some 2.5 billion are missing basic water sanitation (UN [United Nations] 2008, 41f. [and following page]). This has lead to about 4.6 billion cases of disease in 2004 (WHO [World Health Organization] 2008a, 28). About 443 million school days per year are missed due to diarrhoea (UNEP [United Nations Environment Programme] 2007, 37). Collecting water takes a lot of time which in 64% of all households is usually done by women, and in 11% by children, mostly girls (UN 2008, 42). Deaths: 1.63 million people in 2002, most of them children (attributable to unsafe water, sanitation and hygiene; WHO 2007 and 2004b, 1344, 2146). Unsafe water and sanitation is the world's biggest child killer after malnutrition (OECD [Organisation for Economic Co-operation and Development] 2008, 264 and 276). Loss of healthy life-years: 54.2 million of healthy life-years in 2000 (DALYs [Disability-adjusted life years], attributable to unsafe water, sanitation and hygiene; WHO 2002, 228, 68). to halve the proportion of those having no access to basic sanitation (World Summit on Sustainable Development: UN 2002, § 24, 7). Measures: Possible measures range from disinfection at the point of consumption up to rainwater collection and household connections to water. A finance volume of US$ (United States dollar) 10 billion per year would be needed, less than the economic damage caused by diarrhoeal diseases (UNDP [United Nations Development Programme] 2006, 42; OECD 2008, 230 and 265). UNDP 2006 – United Nations Development Programme: Human Development Report 2006; Beyond scarcity: Power, poverty and the global water crisis. WHO 2004b – World Health Organization: Comparative Quantification of Health Risks.